Decide the fate of Stillrise Village. Stillrise Village — Stop the threat to Stillrise Village. After returning the soul gem array, Chieftain Suhlak made me the arbiter over the fate of Stillrise Village. Destroying the soul gem array will allow the villagers to die, but preserving it will trap them in their lifeless state. Speak with War Chief Helushk and Shaman Chirah. Reach the Vile Terminus in the Odious Chapel. Place the Soul Gem Array into the Ice of Stasis or the Fires of Destruction. Speak with Chieftain Suhlak to begin this quest. "Due to the theft of the soul gem array, the war chief and shaman asked me to step down. But as they dispute our future, it's my right to appoint an arbiter. So I appoint you." When you ask what she wants you to decide, she explains: "Whether Stillrise Village continues or ends. Preserve the soul gem array and we remain as we are, in this state between life and death. Destroy it and you end the curse, allowing us a final rest." She tells you that she chose you because "Experiencing our curse uniquely suits you to deciding our fate. You should hear the counsel of War Chief Helushk and Shaman Chirah before making your decision." The rivals stand on either side, staring each other down. Talk to each of them. Helushk will say: "Shaman Chirah whimpers about a curse, but the real curse is allowing someone else to control us with the soul gem array. Something must be done about it. Something permanent." He urges you to keep things the way they are: "Preserve the soul gem array forever. Clavicus Vile's gift has its drawbacks, but it's the only life we have. Don't let the weak-willed take it away from the rest of us." He tells you about a room, deep within Clavicus Vile's shrine, where two braziers burn. Put the soul gem array into the Ice of Stasis and it will be preserved, both protecting the village from necromancy and keeping its residents undead forever. At this point you can promise to go along with this plan, or speak to the shaman. Chirah has a different view: "The Worm Cult nearly unlocked the secrets of the soul gem array. If they could get their hands on it, so could anyone else. This torment will never end, unless you're the one to end it. Destroy it, so Clavicus Vile's grip upon us ends. Our bones may collapse, but out spirits will finally be free." He also directs you to the braziers, but with an emphasis on the other one, the Fires of Destruction. Be aware that whichever one you pledge to support, the other will send their followers to block your way to the Vile Terminus. The spurned party will run off as soon as you make your choice. War Chief Helushk will yell, "You'd kill our people to save them? What madness is that? My warriors won't allow you to perpetrate this foolishness." Shaman Chirah will say "You can't be so cruel. This is eternal torment! My acolytes won't allow you to curse us with life!" Return to the Daedric shrine. 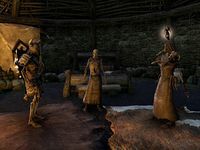 As soon as you enter the room where you offered the totem to Clavicus Vile in the previous quest, you will find three followers of Helushk or Chirah waiting for you. Sneak around or fight your way through, and enter the door in the back that was previously inaccessible. While you make your way around to the Vile Terminus, you will hear the voice of Chirah/Heluskh promising to stop you and pleading with you to reconsider. Finally, in the penultimate room, you will meet the leader himself, with two of his followers. They will fight to the death. Approach the braziers. Clavicus Vile will speak to you. "You've felt the true splendor of my gift to Stillrise Village. What gift have you for them, I wonder? Preserve their existence or end it forever. Which will it be? Probably the boring one." The Fires of Destruction are on the left, and the Ice of Stasis is on the right. This is your final opportunity to change your decision. 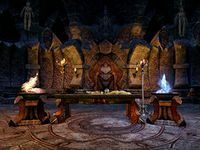 Whichever brazier you place the soul gem array in, Clavicus Vile will speak again, mocking your choice and showing perverse delight in the negative consequences of your actions. He will turn you back into your normal form and say, "Now begone." The exit is just behind the braziers. You will be just south of where you came in. Make your way down to the center of the village to find Chieftain Suhlak. If you chose to preserve the villagers, she will muse: "You've chosen what we couldn't for ourselves. Without the fate of the soul gem array held over us, we can finally begin to think of our future. Thank you, arbiter. You are always welcome in Stillrise Village. You've protected Stillrise Village from weak thinking and necromantic tyranny. More than anything, you've given us a future. Possibly beyond these huts in this swamp. We're our own people now, and we couldn't have been without your help." If you chose to destroy the villagers, she will say: "And so it ends. You made the choice we could not. My people are now at peace. At last! You've freed us from our miserable existence. This was no life, just a mockery of better days. I feel Clavicus Vile's curse fading. It won't be long now. Thank you for allowing us the dignity of death." Either way, you will receive the Skeleton Polymorph, which will go directly to your Collections, and some gold. Helushk's followers consist of Knights, Archers and Soldiers, while Chirah's are Augurs and Skirmishers. This page was last modified on 11 February 2019, at 05:21.